A new (to me) designer and a giveaway! I knew immediately which fabrics I would use for the bag. The centre panel is perfect for a FQ of a special print you want to showcase. I chose Utopia by Frances Newcombe from Art Gallery Fabrics; the centre is Paradise Dwellers in Vivid, fromStay Home Fabrics, and the coordinating print is Orni Incandescence, from Fabric Spark. I decided to try vinyl for the first time with this bag, and I like the finished look, but it was certainly not as easy to work with as natural fibres. I was also happy to have my By Annie's Zippers by the Yard from Stitch in the Ditch so I could choose the perfect colour for the zipper pull. The pattern includes interfacing suggestions, but I just used what I had on hand, so my bag has craft fuse and fusible fleece on the lining, and for the pleated panels, I used Shapeflex 101, and finally craft fuse on the centre panel. The Zinnia pattern has a recessed zippered closure, and a zippered interior pocket, plus a large interior slip pocket. The pattern also has a few options: you can do a longer single cross body strap, or 2 shorter handles, with detailed instructions for both options. The other option available is that you can have the main panels of the bag continue to the bottom, without a separate contrasting strip like the option I chose. As in the listing description, this particular pattern is not recommended for beginners, and I would agree. I even had a few questions, but I was very impressed that Celine responded right away, and even made a couple changes to the pattern to clarify the points I brought up. 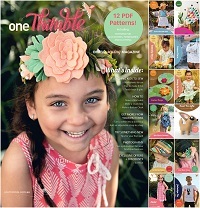 With all the different options in this PDF pattern, it's a great value. I really love the functionality of this bag, with its great size and zippered top, and the pleats add such an elegant touch. Bonus entries for following me on Instagram and Pinterest, just leave a separate comment for each letting me know. i can't decide between Iris and Camellia.....and frankly they are all so nice.....Reece, we should add her to the CSG, no? I like the Isis best I think. I love the look of the Iris Convertible bag. I love the Peony Pocket Tote! Begonia convertible bag!! So pretty! I LOVE Celine and Blue Calla! My favorite is the Lily pleated bag. I love the shape of the Iris bag! I like them all but if I had to pick I would pick the convertible bag. Thanks for the great giveaway. I've also shared your giveaway on my Giveaway List for sewers & quilters at wowilikethat.com. Thanks again. Hard to choose but I think I like the Thistle Tote best. I love the Iris bag. I think I'll have to add that to my repertoire. I'm drawn to the Iris, love the dual handle option! The thistle pocket tote is my favourite. P.S great name - I love Okapis! My favorites are the Zinnia zipper panel bag and the Peony pocket bag. Love supporting Canadian designers!! That thistle pocket tote is adorable! I love the Begonia Convertible Bag. So cute! So many nice patters. Iris is my favorite. I made it last week and love it. Begonia Convertible Bag is my favorite. I'm a big fan of small bags. Thanks for the chance to win! I've been eyeing the magnolia mini messenger for a while. It's such a handy size. I love the Begonia Convertible Bag. I hope to win this prize! My favorite is the Zinnia! thanks! I love the Camelia bag! Thank you for the chance to win! Love the Iris convertible bag!! Thistle Pocket Tote is my fave. the Thistle Pocket Tote Crossbody is my favorite. I just saw the bonus entries!! Yea! Instagram follower. The Lily Pleated bag is currently my choice. Great Bags. Hello, I would love to try my hand at the The Camellia Cross Body Bag. Thanks for a great giveaway! I follow you on Instagram as trishden. Thanks! Loving the Camellia crossbody bag! Would love to make this. Haven't come across Blue Calla before, but so glad I have now!! am now following you on Pinterest! Followed your purses Pinterest board. They are all beautiful but I'm really likeing the thistle one. Oooooo I just can't decide! I really like the Zinnia zippered pocket pattern. Added as a favorite seller on Etsy! I'd choose the Camillia cross body bag. Looks very pretty! Lots of great bag patterns! I love the Iris and the Begonia the best! Thanks!